NEWS | First Open Session this Sunday! 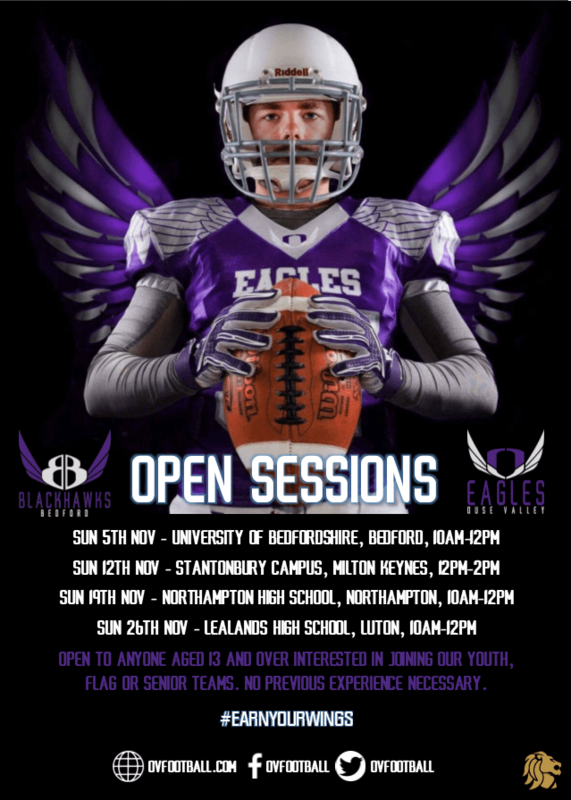 Open to those interested in playing for the Ouse Valley Eagles senior (18+) or Bedford Blackhawks Youth (13+) full contact teams as well as the Blackhawks senior flag (16+) team, the first Open Session of the month takes place this Sunday in Bedford. The session runs from 10am to midday at the University of Bedfordshire’s Bedford Campus on Polhill Avenue, and registrations open at 9.30am. It’s not too late to register your interest in any of our sessions. Just complete the form below, get in touch via Twitter or check out the events on our Facebook page. The Eagles travel to the south coast this Sunday to take on the Solent Thrashers in the SFC 1 semi-final at Test Park (2.30pm kick off). Sunday’s game will be the third meeting of the two sides in the club’s short history. Last season Solent knocked the Eagles out of the play-offs at the quarter final stage, and earlier this season a record-breaking field goal was the difference as the Thrashers edged a close one 17-14. Since that defeat the Eagles have won three on the bounce; 35-15 against Cambridgeshire Cats, 23-18 vs Birmingham Bulls and 38-27 two weeks ago at the Hertfordshire Cheetahs. The Thrashers meanwhile lost to Colchester before bouncing back with a thrilling 33-33 tie with the Farnham Knights, and a 51-0 demolition of East Kent Mavericks to finish the season the #2 ranked team in SFC 1 with a record of 7 wins, 2 defeats and 1 tie. They have one of the meanest defences in Division One, with only the Edinburgh Wolves (89) conceding less points than the Thrashers’ 135 during the regular season. Our hosts also have the fourth best offence in Division One. Their total of 335 points scored was bettered by the Merseyside Nighthawks (462), Farnham Knights (405) and Edinburgh Wolves (398). In team news, offensive lineman Danny Cousins remains doubtful due to a knee injury sustained in the victory over the Cheetahs but the Eagles welcome back a number of defensive players who missed the game, including Andy Larwill and Darren Gregory. Gareth Pullen is also expected to be fit to play. Alternatively you can get directions by entering the relevant information in the map below. Admission is free, and there are bar and catering facilities available. If you are unable to make it to the South Coast we will be providing live, play-by-play coverage via our Twitter channel from 2.30pm.